This sounded great. Energy efficient, LED bulbs which could change colour to match/create moods, and which you could control from your Smartphone? Where do I sign up? Well, I signed up on the Kickstarter page, obviously. This morning, the Lifx bulbs I bought were delivered, so I decided to put them to the test. The photo at the top of this post is of a lamp in my home powered by a 12W Philips CFL bulb. I swapped out the CFL for the Lifx LED bulb and I was immediately impressed with how quickly it lit up and how bright it is. The photos were taken with identical camera settings* but look different due to the different brightness of the lights, and the different colour of their light. 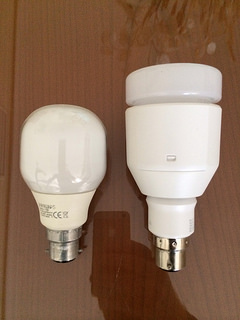 The lamp on the left is being lit by the Philips 12W CFL bulb, while the lamp on the right is being lit by the Lifx 17W LED wifi connected bulb. The LED bulb, when turned off by the app, still consumes 2.7W of electricity (maintaining wifi so it can be turned on again presumably). To avoid this, it needs to be physically turned off at the switch. 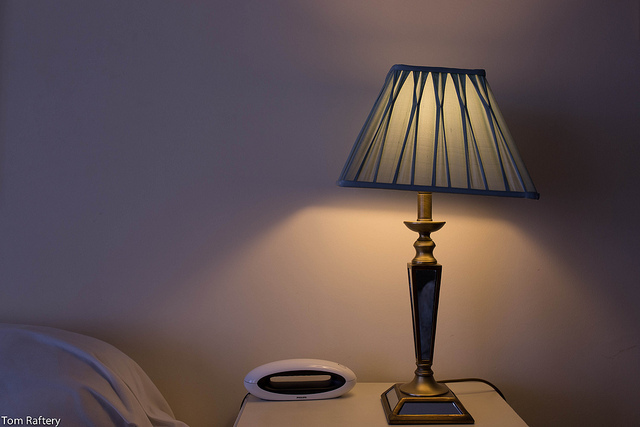 Unfortunately the Lifx bulb is not remotely accessible – you need to be connected to wifi to turn it on or off, so if you’re out and realise you’ve forgotten to turn your lights off, there’s no way to turn them off from your smartphone (unless the very cool Revolv app starts to support Lifx bulbs). Bottom line – the Lifx bulb is a nice little bulb and a great job by its developers for a v1.0 of their first product. Having said that, its main competitor seems to be the Philips Hue series of wifi connectable, colour variable, smartphone controllable bulbs, and they’re for sale on Amazon.com for $59.97 which is far cheaper than the Lifx at $89. Also, Revolv support the Hue series of bulbs, so it is likely they are remotely controllable. Given that, unless Lifx addresses particularly the cost issue, I’d have to advise anyone interested in Internet of Things connected lighting to look at the Philips solution instead. If I get my hands on the Philips bulbs, I’ll review them here subsequently. One final note, the Philips CFL bulb rated at 12W was actually drawing 13.5W, while the Lifx bulb rated at 17W was drawing between 17W and 18W. *Both photos were taken with the camera on full manual mode with shutter speed at 50, ISO at 200, aperture at 4.5, and white balance set for fluorescent light (4000k approx). You clearly have never used the Phillips Hue if you’re recommending it over LIFX. Not sure why JJ says you’ve “clearly” never used the Hue to recommend it — it has 4 stars on Amazon with over 200 reviews. So some people must like it, even if JJ’s had a bad experience. It’s possible he’s referring to the low lumen output of the Hue, which seems to me it wouldn’t be an adequate replacement for a 60-watt incandescent. It does, however, consumer about half the energy of the LIFX.